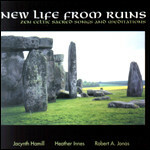 Healing God is from our CD, New Life from Ruins. Lyrics by David Adam, in Rhythm of Life, SPCK © 1996 David Adam. All: You alone make us whole.